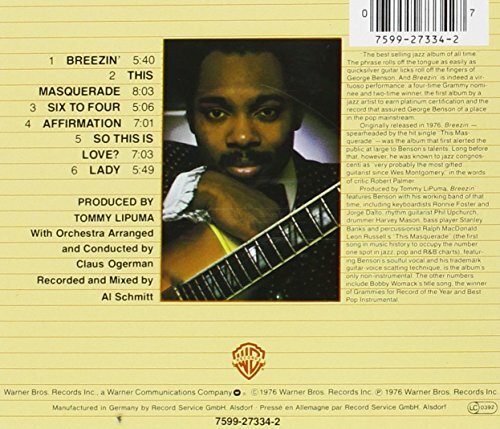 Before this album was released in 1976, George Benson was known largely for his Wes Montgomery/Charlie Christian-inspired licks and his stints with Jack McDuff and Miles Davis. Breezin' was a million-selling, Grammy Award-winning LP and made Benson an "overnight" star. The reasons for that success were Tommy LiPuma's topnotch production, Claus Ogerman's ethereal arrangements, and Benson's soulful vocals on Leon Russell's ballad "This Masquerade." 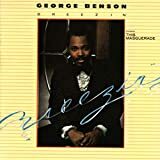 Backed by Fourplay drummer Harvey Mason, master percussionist Ralph MacDonald, bassist Stanley Banks, rhythm guitarist Phil Upchurch, and keyboardists Ronnie Scott and Jorge Dalto, Benson and the crew laid down the moods and grooves we now call "contemporary jazz." From the soft-rock of "Six to Four," the midtempo backbeat of the title track, and the Latin-tinged tunes "Affirmation," "So This Is Love?" and "Lady," Benson's fleet-fingered Ibanez guitar lines make the rare leap from straight-ahead to the mainstream. Added to the CD reissue are three bonus tracks not on the LP: a snappy and soulful rendition of "Down Here on the Ground," from the movie Cool Hand Luke, a Bob James-like funk number "Shark Bite," and the single-edit version of "This Masquerade." George Benson was never the same after this record and neither was jazz. --Eugene Holley, Jr.